Pro-Immigrant Republicans React to AZ Election Results: AZ Turning Purple! Phoenix, Arizona – National pro-immigration GOP group Cafe Con Leche Republicans today reacted to Arizona’s election results. Nationally, the election results show the Republican Party needs to fundamentally change the way the GOP engages with Hispanics, who overwhelmingly voted for Obama, especially the tone on immigration. According to a Pew Research polls, 62% of Hispanics are center-right ideologically, yet Mitt Romney received 23%, barely one third of that. Just eight years ago President Bush received over 40% of the Hispanic vote. In 1994 California Gov. Pete Wilson jumped on the anti-illegal immigration Proposition 187 bandwagon to bolster his flagging reelection poll numbers. Proposition 187 drove legions of conservative Hispanics from the GOP, and the GOP has not been competitive in statewide races in California ever since. Arizona has been the scene of some of the harshest rhetoric on immigration, and this week’s election results show many Arizonans, especially Hispanics, reject extremism on immigration, and while they want secure borders, they also want practical and humane solutions to our broken immigration system. For a ‘deep red’ state, this week’s results show that extremism on immigration is hurting the Republican Party in Arizona. Normally Arizona’s U.S. Senate seats are ‘safe’ for Republicans because Arizona is a very conservative state, but Jeff Flake received a bare majority, just 50.01%, in his U.S. Senate race against a Democratic candidate with considerable personal baggage. Libertarian party values and positions are much closer to conservatives than liberals, and it is apparent many conservatives voted Libertarian in protest against the Arizona GOP’s heavy tilt into extremism in recent years. In Congressional districts one and nine, and senator from LD 8, it is apparent the Libertarian candidate siphoned enough votes away from the GOP candidate that the Democrat won the election! 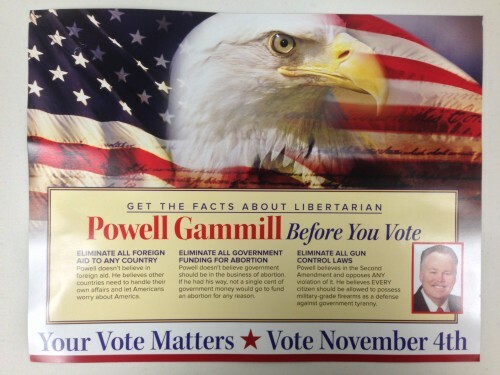 It would be easy to attribute the Libertarian protest vote to other reasons, but in the 2010 election Libertarian Andrea Garcia won 9% of the vote against Russell Pearce, one of Arizona’s most notorious immigration extremists, the second highest ever for any Libertarian candidate in a competitive three-way race. Andrea Garcia was a GOP activist for many years, before moving to Mesa and finding an unwelcome climate in the GOP there, and switching to Libertarian. Another Republican activist for many years, Blanca Guerra, left the GOP and ran as a Libertarian, in large measure due to the hostility she encountered. Blanca was one of Cafe Con Leche Republican’s founding members, and initially ran as a GOP candidate for CD 3 before leaving the GOP (and Cafe Con Leche Republicans) to run as a Libertarian. In reviewing election results for CD 3 over a period of years shows candidates with more extreme views on immigration lose by larger margins. A welcome exception to Arizona’s trend towards purple is Bob Worsley’s election as Senator in LD 25. Bob Worsley is a conservative Mormon, who has been pastor in a predominately Hispanic Church, spent years overseas as a missionary in Latin America, and has sensible views on immigration and understands immigration and Hispanics. Not surprisingly, he won handily against his Democratic opponent, and also handily defeated Russell Pearce in the GOP primary. About Us – Cafe Con Leche Republicans is a national organization of Republicans who welcome “New Americans”, defined as immigrants and family of recent immigrants. Our mission is to make America and the GOP, more welcoming to “New Immigrants” through political activism, “in-reach” and education within the Republican Party, and lobbying government to adopt more immigrant friendly policies. We also seek to bring more conservative and moderate “New Americans” to the Republican Party. These efforts will strengthen the GOP, and lead more Republicans to embrace welcoming policies for immigrants and their families. We have members nationwide, with chapters in Florida, Georgia, Illinois, Iowa, Minnesota, Texas, Oklahoma, Arizona, and California. Our members and leadership are predominantly Hispanic, though we define ourselves by mission and guiding principles, not ethnicity, and we welcome all who share our goals. Our leadership is 100% Republican.